Birmingham Public Library - Archives: Robert Jemison, Jr.
Robert Jemison, Jr., was born on February 28, 1878, in Tuscaloosa, Alabama. In 1884, his father, Robert Jemison, Sr., moved the family to a new home on Sixth Avenue and Twenty-First Street in Birmingham. Jemison attended Powell School and South Highland Academy in Birmingham before enrolling in the University of Alabama in 1895 and finishing college at the University of the South, Sewanee, in 1899. After graduation, Jemison returned to Birmingham where he began his career as a hardware store clerk before establishing himself in the real estate business. He and his wife Virginia Earle Walker married in 1901 and had three children. Jemison was involved in many civic organizations throughout his life, including service as the first president of the Birmingham Chamber of Commerce, first chairman of the Birmingham Chapter of the American Red Cross, and a chairman of the Community Chest/United Fund. In 1903, Jemison organized Jemison Real Estate & Insurance Company, and it was as a real estate developer that Jemison would shape the landscape of the South’s most prominent industrial city throughout the twentieth century. During his early career, Jemison developed Ensley Highlands, Earle Place, and Central Park, all communities and subdivisions in western Birmingham designed primarily based on the grid system. Later Jemison developments, however, would take advantage of natural contours and features of the land while providing modern conveniences such as paved streets, sidewalks, sanitary sewers, and gas lighting. It is for this vision of designing with the land to provide healthful and beautiful environments both for the land and its inhabitants that Jemison is best remembered. To help him translate this vision to reality on the landscape of Birmingham, Jemison hired the best local and national practitioners. 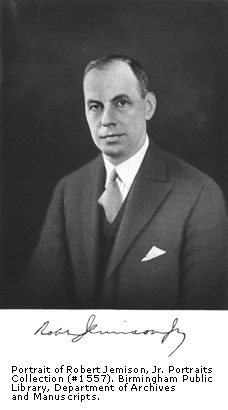 He hired noted planner Samuel E. Parsons of New York to plan Mountain Terrace (now Forest Park); distinguished Boston landscape architect George H. Miller to plan the model industrial town of Corey (now Fairfield) and the estates of Altamont Road and Valley View; the Joy brothers to design Roebuck Springs and Roebuck Terrace; local engineer John H. Gladner, Jr., and landscape architect William H. Kessler to design the upscale residential area of Redmont Park; and Boston landscape designer Warren H. Manning to design Mountain Brook Estates, the culminating achievement of the Jemison Companies. The Robert Jemison, Jr., collections contain a wide range of materials related to both personal and business matters. Jemison’s business papers contain correspondence, legal agreements, maps, blueprints, photographs, promotional materials, brochures, and other records related to Jemison’s real estate development ventures. Copies of The Jemison Magazine for the years 1910-1914 and 1926-1930 covering the development of Fairfield (Corey) and Mountain Brook by the Jemison Company are included in the collection. Jemison’s personal papers include his collection of genealogical data pertaining to his family, newspaper clippings and other printed material relating to the families, photographs, memos, and reminiscences. Jemison’s business papers are organized as Individual collections according to the following company and organization names and include: Central Mortgage and Trust Company Records; Central Park Land Company; Chamber of Commerce Construction Co, 1909-1954; City Housing Corporation; Corey Land Company; Crawford, George Gordon, Correspondence; Elmwood Corporation; Empire Improvement Company; Fairfield Land Company; Forest Park Realty Company; Glenwood Realty Company; Jemison and Company; Jemison Mortgage Company; Jemison Real Estate and Insurance Company; Mountain Brook Club Properties Company; Mountain Brook Estates, 1920s; Mountain Brook Land Company; Mountain Terrace Land Company, 1905-1914; Papers (General Business); Redmont Garden Apartments, 1938-1945; Redmont Land Company; Ridgely Apartments; Smith, Ruffin, Correspondence; Spring Lake Farms; Tanner, A. B., Correspondence; Thomas Bartee Correspondence; Tuscaloosa Development Company; Tutwiler Hotel Company; Twentieth Street Realty Company; and Woodward Iron Company, January 1924-June 1926. Altamont, A Study for General Subdivision and Arrangement, A Portrait of Red Mountain at Birmingham, Alabama, George H. Miller Landscape Architect, Boston, Mass., November 27, 1911. File #6.19.2.1.30. Jemison, Robert, Jr., Collection (Mountain Terrace Land Company). Birmingham Public Library, Department of Archives and Manuscripts. 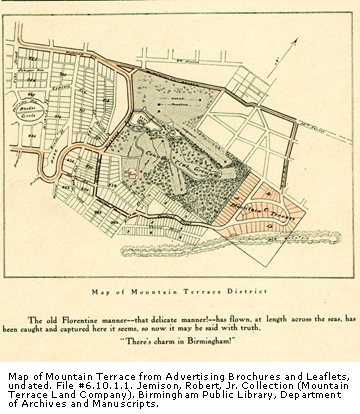 Map of Mountain Terrace from Advertising Brochures and Leaflets, undated. File #6.10.1.1. Jemison, Robert, Jr. Collection (Mountain Terrace Land Company). Birmingham Public Library, Department of Archives and Manuscripts. Portrait of Robert Jemison, Jr. Portraits Collection (#1557). Birmingham Public Library, Department of Archives and Manuscripts. Morris, Philip A. and Marjorie Longenecker White, eds. Designs on Birmingham: A Landscape History of a Southern City and Its Suburbs. Birmingham, Alabama: Birmingham Historical Society, 1989.